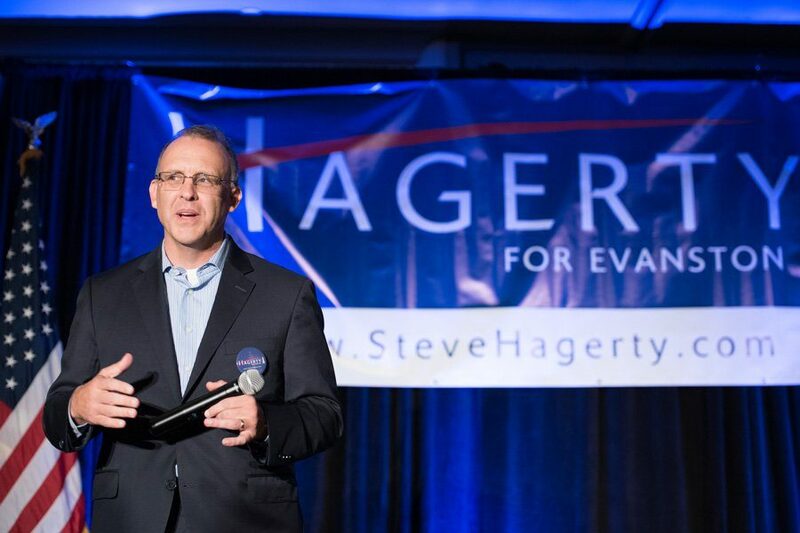 Mayoral candidate Steve Hagerty at his campaign kick-off event in October. On Tuesday, outgoing Mayor Elizabeth Tisdahl endorsed Hagerty as her potential successor. Evanston Mayor Elizabeth Tisdahl endorsed Steve Hagerty — a businessman who has pledged to build on her legacy — as her successor Tuesday. Hagerty, who has lived in Evanston for 17 years, said he was “thrilled” to gain the endorsement and promised to build on Tisdahl’s “terrific accomplishments” over the past eight years. The businessman kicked off his campaign in October with support from former mayor Lorraine H. Morton. Hagerty said he has three major goals for Evanston: expand economic development to all neighborhoods, strengthen youth development to reduce violence and maintain diversity through affordable housing. Hagerty owns an Evanston-based consulting firm that employs more than 100 professionals from all over the country and has assisted more than 30 states in recovery and preparedness projects. Earlier this month, he told The Daily that he wants to transition away from the business and focus on the city. “I can continue to have a part-time role here with my company, but it affords me the flexibility that I need to help the city,” Hagerty told The Daily last month. Two other mayoral candidates have also recently picked up endorsements: Ald. Brian Miller (9th) has been endorsed by the Chicago Federation of Labor and Ald. Mark Tendam (6th) has been endorsed by the Evanston Firefighters Association and by U.S. Rep. Jan Schakowsky (D-Ill.). Early voting began Monday ahead of a primary on Feb. 28. The top two candidates will then move on to a general election in April, unless one receives more than 51 percent of the vote, in which case he will automatically win.